Loving Life and Living on Less is hosting this amazing giveaway sponsored by Ronco. Check out LLandLoL's review by visiting the site. I use my food dehydrator tons, thought I still would love one of these Ronco ones!! This is a great giveaway that you won't want to miss!! 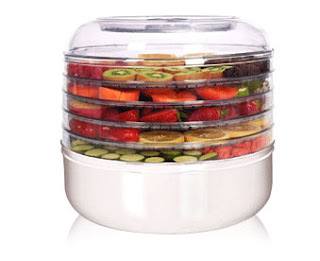 Enter the Rafflecopter below for your chance to win a Ronco 5 Tray Food Dehydrator. A Year of Jubilee Reviews is not responsible for prize fulfillment. I would dry fruit mostly. I would make Kale Chips! I would try to dry tomatoes. I found on Pinterest: LLandLoL which belongs to a Nicole Powers. Pinned it - one of her DYI's on Coffee Syrup on my Pinterest site. Hope this is the right one as you didn't have a link to it. Thanks.